Following a successful website for Devilishly Disabled, Matt required another dynamic and unique looking ecommerce website as well as some branding for a new business – Dad’s Place. 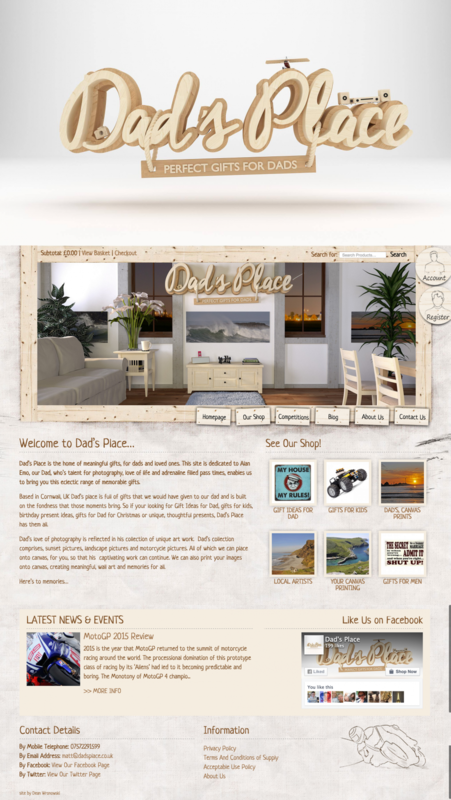 The idea behind Dad’s Place is to offer high quality gifts for Dad’s and loved ones in and around Bude, Cornwall. The objective of the website was to create an online ecommerce website full of gifts for Dad’s, Gifts for Kids, birthday present ideas and gifts for Dad for Christmas. The website had to be attractive and appealing, to achieve this a series of hand drawn sketches were produced to give the website to have a relaxed feel whilst also giving the website a seaside feeling. The sketches were based on some of the products that are on offer on the website. The site was designed to be very easy to use, letting users pick and choose the products they wished to investigate further. Each user has their own account area where they can upload your own canvas pictures (to be printed) and to send messages to and from the admin’s of the website. The website was a bespoke website made by using WordPress (as the content management system) and the Woocommerce (as the ecommerce system) allowing for flexibility which was perfect for the needs of Dad’s Place.